The method is not recommended for novice traders. It represents a quite interesting approach that would rather suit Forex traders, who like placing all money at once on a particular trade. But at first, a trader should divide his account into several equal parts to ensure that the whole capital will not be blown away in one shot. Supposing that a trader plans to trade $10 000 USD lots, it's suggested that an account opened with a broker "weights" in between $1000 to $2000 USD. Then a "play" with a margin starts. Depending on the leverage that is going to be used and carefully choosing a lot size, a trader can calculate the point where a margin call will occur. This point will work as a global stop loss, which if crossed, will cause the account to be closed automatically. A predetermined risk, no concerns about the manual stop loss, a maximum trading position size — all that creates the whole new approach to trading Forex. 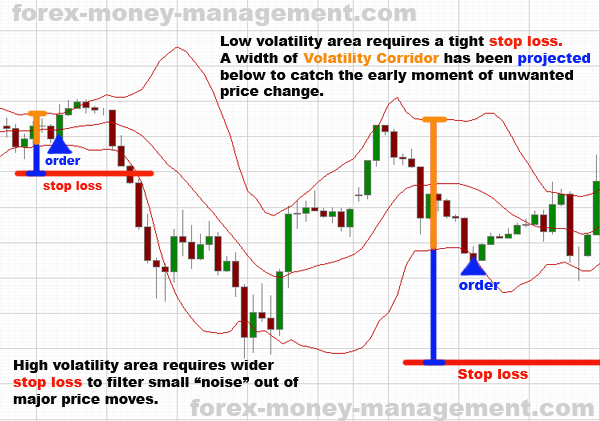 Price volatility can also be used when placing a Stop loss order. During active hours & high market volatility, traders should place stops further than usually to avoid seldom price noise and react only to major price changes. During the periods of a low market volatility, protective Stops should be placed closer in order to react in time should the market accelerate. One of the good technical tools to measure price volatility is Bollinger bands indicator. Simply because too many traders react on those "rally events", one can face a situation when it becomes impossible to access a trading platform in order to close the order or at least place a protective stop. When there is a serious shake up in the market (due to news announcements, economical, political and other events), trading servers can be quickly overloaded and can cause trading delays or not respond at all. In such cases Forex traders become helpless while money is draining out of their accounts. The only option here would be to call your Forex broker and make voice orders. Again, there will be no guarantee that brokers aren't overloaded with calls at this moment as well, and so trader should wait... dreaming how simple things could be if a stop loss was there. Wish you to make wise decisions and never experience such troubles!